It’s ice dam season again! FGS Restoration is busy responding to water and moisture damage that results from these drastic winter warm-ups which are a major cause of ice damming. If you missed winter maintenance this fall, you may have ice dams, too. Learn how to prevent and maintain the health of your roof and home. Ice dams are large chunks of ice that form on the edges of roofs, commonplace during Wisconsin winters. They are created when your attic warms the bottom layer of snow on the roof above it. The warmed snow then turns to water and travels to the cold, extended eave, where the water freezes again, and ice builds up. Flat roofs are especially susceptible to ice dams, as are gutters since they hold snow and ice. 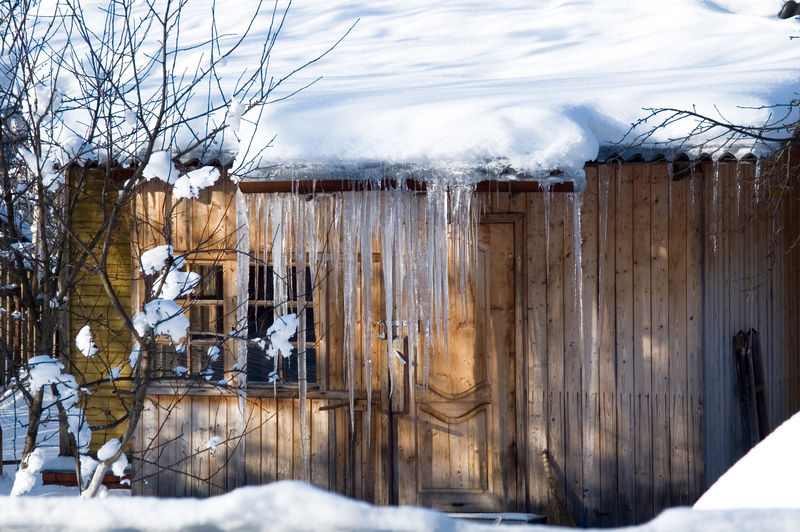 Gutters, downspouts, your roof and your home can all be damaged by ice dams. What kind of damage from ice dams can I expect? Internally, large ice dams cause water to seep under shingles and eventually into your insulation. Over time it could travel through ceilings and walls into sheetrock and paint, causing mildew and more. Externally, ice dams could rip shingles and gutters off your home and land on anything beneath it, including your family or neighbors, animals, cars and more. If water stands long enough it could also begin to rot your roof or wood inside your home. Removing an ice dam is extremely intricate, and relatively unsafe, work. The ice must be delicately broken into small pieces with a blunt tool, both on the eaves and inside gutters and downspouts. Even experienced professionals have trouble with this, as it’s possible to tear or damage individual shingles off the roof with the ice. You should absolutely avoid climbing on your roof as your body weight can cause frozen shingles to break. You can use heat cable to melt the ice, but this will take some time for the ice to fully melt. After large chunks have been removed, pour calcium chloride onto the ice dam. A helpful tip is to leave it inside of a bag with many holes so that it stays in one spot, melting it away. What about water damage in my home? Water that has backed up under shingles and found its way into insulation and wall cavities must be thoroughly dried or else mold or mildew can begin to grow. Also, water that is left trapped in these areas can result in swelling and rot of the structural components hidden in the ceilings and walls. FGS Restoration uses moisture inspection tools to find the trapped or hidden moisture. After the moisture is found, specialty drying tools are used to dry the affected materials to prevent further damage. Call today for a free inspection and quote for restoration services. What is the ultimate solution for my ice dam jam? FGS Restoration can assist with sealing, insulation, and venting in the attic and eaves to treat ice dams before they start. Since your attic is the cause of the problem, you must seal warm air leakage, insulate your home properly and vent so heat vanishes, and doesn’t warm your roof. In turn, your home is not only warmer but more cost effective! Call today for a free inspection and quote for our restoration services!